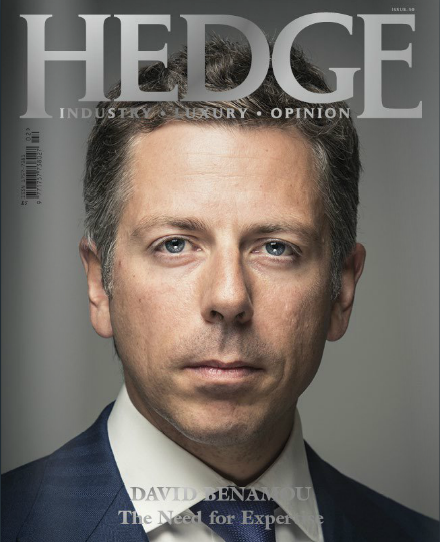 Hedge Magazine, 2014. Original article (p36-38). There are bales of hay inside the offices of Albourne Partners, providing a surprisingly folksy feel for a global hedge fund advisory firm. The village environment is a heritage from the company’s roots in Albourne, Sussex, where it all started 20 years ago. But in spite of the decorative apples and cows it’s clear we are in Westminster now, and Simon Ruddick has his eye on the world. In the most literal sense, this is: Ruddick is one of the key architects behind the Opera initiative, a global effort to standardise how hedge funds monitor risk. “I think that’s possibly the most fun part of my job,” says Ruddick, who has frequent meetings with regulators about the Open Protocol Enabling Risk Aggregation, Opera for short. The co-founder and Managing Director comes across as surprisingly casual despite his striped tie and grey trousers, of the kind that seem likely to have a matching jacket left on the back of a chair somewhere. He is personable and cheerful, as his speech turns into a rapid fire when on the topic of his enthusiasms. Because that’s what work is for Ruddick: an enthusiasm. And why yes, he certainly wants Opera to become the golden standard for the global hedge fund industry. One place where these sorts of whispers may be shared is the Albourne Village; not the real one in Sussex, but Albourne Partners’ online hedge fund community which now boasts over 80,000 active residents. 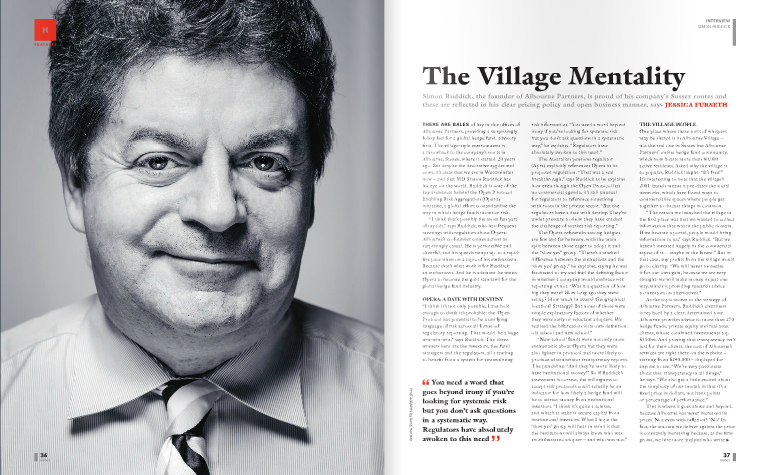 Asked why the Village is so popular, Ruddick laughs: “It’s free!” It’s interesting to note how the Village’s 2001 launch means it pre-dates the social networks, which have certainly found ways to commercialise spaces where people get together to discuss the things they have in common. As Albourne Partners celebrates its 20th year, Ruddick has maintained the village roots as an inspiration for more than just the decoration: “We’re a bit of hippie commune!” He says this jokingly after telling me about Hedge Stock, a company event a few years back where The Who provided the entertainment. The motto was ‘Make Money Not War’. On a more serious note, Ruddick nods to the company’s “village creed” not just in terms of the transparent pricing, but also the clear rules on how profit is distributed: 50% goes to base cost, 25% to bonuses, 25% to the firm. Posted on 05/31/2014 by Jess. This entry was posted in Investment and the market and tagged albourne partners, alternative investments, hedge fund, hedge magazine, simon ruddick. Bookmark the permalink.